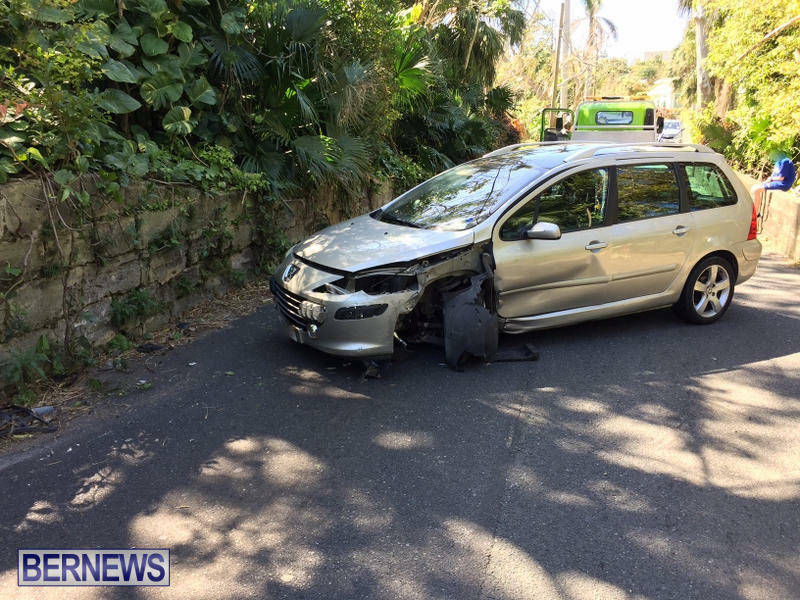 [Updated] Emergency services responded to a collision on Middle Road in Paget at approximately 2.15pm this afternoon [March 18] involving a car. 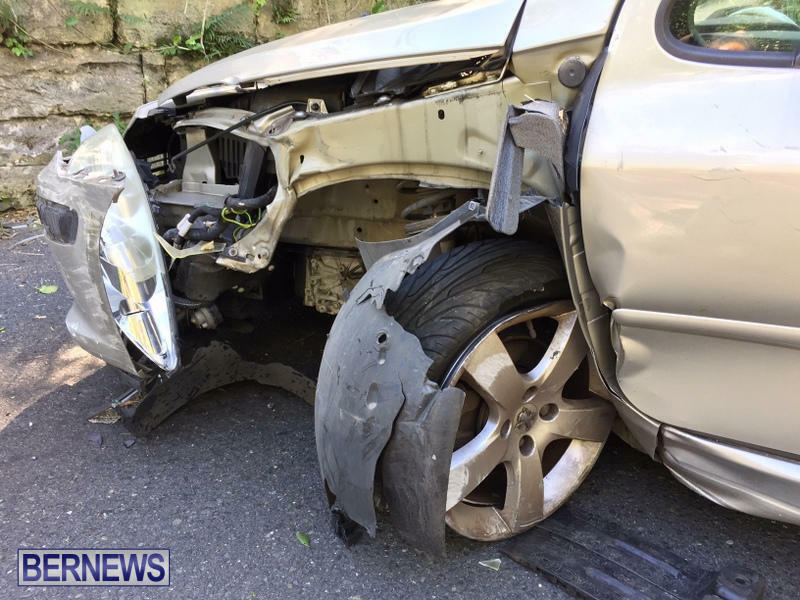 Bermuda Fire and Rescue Service personnel tended to the injured driver before she was transported by ambulance to King Edward Memorial Hospital for treatment. The roadway was temporarily blocked and traffic was diverted away from the location while emergency services were on scene and a tow truck was called to remove the vehicle. Details are limited at this time, however we will update as able. 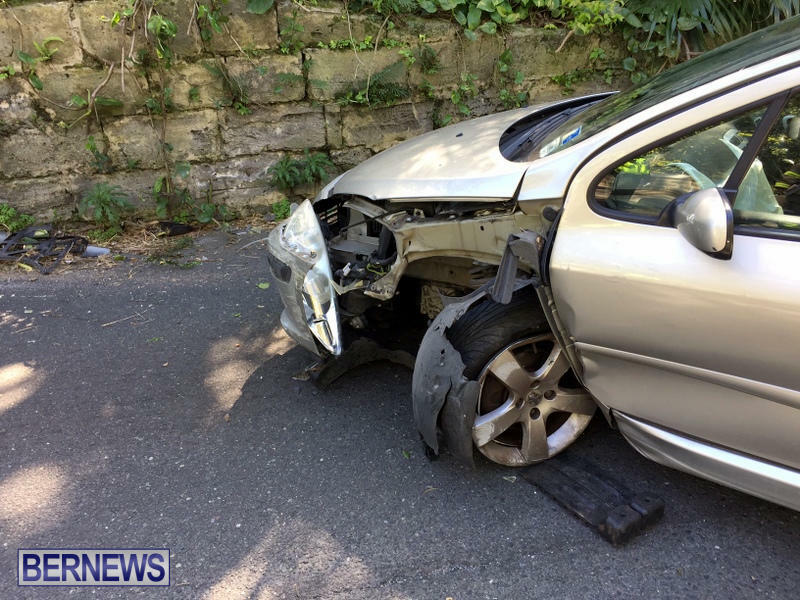 Update March 20, 11.42am: The police confirmed that a 70-year-old Devonshire woman was treated and discharged from hospital following this collision. Remember…A head on collision means if a car is at 50kph,and the other vehicle is at fifty…At point of impact it is 100kph! Or 62.137 mph. Check out Mythbuster’s on this…you’re incorrect. (Newton had it right.) Hope everybody is OK.
Because you have a mouth and it puts out noise when you open it doesn’t mean you have to talk nonsense. Just stop it. I hope all injured is doing well. Times must be changing. 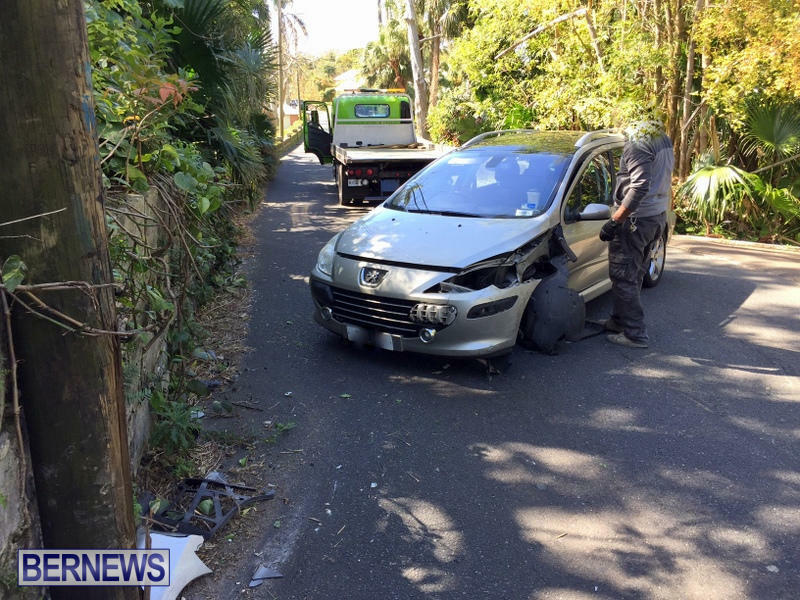 I was sure this article would have the usual bunch of nonsensical comments peppered with phrases such as, “how on earth does this happen when the speed limit is 35kmh…”, “…Bermudians are the worst drivers in the entire world…”‘ “…this never would happen anywhere else…”‘ Etc, Etc. 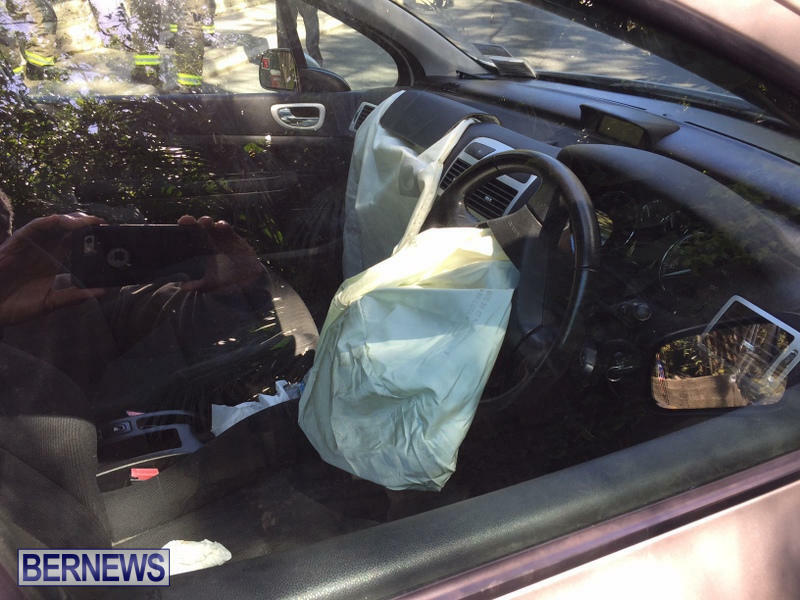 All comments from people who NEVER ride or drive at 35kmh or religiously obey the speed limit in whatever country they live in., have had at least one accident in their otherwise lovely life or never read their own local news…. As for the traffic collision investigator lesson up above….if a car traveling at 50kmh has a perfectly head on collision with another car traveling at 50kmh in the opposite direction, it IS similar to one car traveling at 100kmh having a perfectly head on collision with a solid unmovable object. Bermudians are sh1t drivers. There’s living proof every single day. More nonsense, read Newton’s 3rd Law. When the vehicle hits the rock wall at 50 km/h, the rock wall causes a force large enough to stop the vehicle right there. In other words, the vehicle hits the rock wall with a momentum equivalent to its speed times its mass. Conversely, by Newton’s law, at the moment of the collision the rock wall causes an equal force to the vehicle in the opposite direction, causing it to stop. That is, the rock wall causes a force equivalent to the 50 km/h times the mass of the vehicle. The misconception in the two-vehicle scenario is basically that this applied force is double that, ie. the equivalent to 100 km/h times the mass of the vehicle. However, think about where this force is coming from in the two-vehicle scenario: It’s coming from the second vehicle. But the second vehicle is also traveling at 50 km/h and has the same mass. So we have two forces: Vehicle 1 applies the equivalent of 50 km/h times its mass to vehicle 2, and vehicle 2 applies an equal force to vehicle 1. This causes both vehicles to stop right there. Where would the additional 50 km/h times the mass of the vehicle come from? Vehicle 1 cannot apply that force to itself. It’s applying it to vehicle 2. So where is it coming from? The answer is that it’s not coming from anywhere because the force applied to vehicle 1 is not 100 km/h times the mass, but only 50 km/h times the mass. The same as with the rock wall. Think also about this: If you applied a force equivalent to 100 km/h times the mass in the opposite direction of vehicle 1, that would actually make vehicle 1 change direction and go backwards at 50 km/h after the collision. Conversely it would also make vehicle 2 do the same. That doesn’t happen. Think about it like this: If vehicle 1 couldn’t “see” what it hits, how can it tell if it hit a rock wall or vehicle 2? The “point of impact” remains stationary in the two-vehicle case, in the exact same way as in the one-vehicle-and-rock-wall case. From the point of view of vehicle 1, there’s no difference. Now, if vehicle 2 was stationary and vehicle 1 hit it at 50 km/h, that would make a big difference compared to the rock wall. That’s because now vehicle 2, having the same mass as vehicle 1 (rather than “infinite” mass, as the rock wall), is applying much less force to vehicle 1. Hope that helps! Check the cell phone. Probably texting or reading a text. See it all the time. Heh! Thank you. Are you a WA A..?